Does this anticipated sequel live up to the hype? If you travel south enough at this time of the year, you will find summer somewhere; so it’s perfectly fine that Activision waited until November to release the single best high-octane summer blockbuster of the year. And it is a blockbuster indeed, as VGChartz data has the game at 7 million sales by the end of opening day. 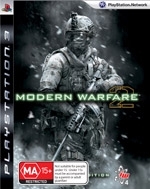 Being the sequel to a revered game like ‘Call of Duty 4: Modern Warfare’ is no small task, but once you pop in the disc you will quickly be able to tell that Infinity Ward was bent on surpassing expectations. 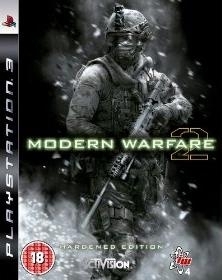 Modern Warfare 2 is a rare title that brings a variety of experiences and vividly impresses you with all. 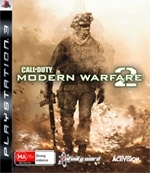 Call of Duty: Modern Warfare 2 starts five years after the ending of the original game. From the beginning, the narrative draws you in and the action never stops. The story feels like a summer popcorn flick, and at times is can be hilariously cheesy. 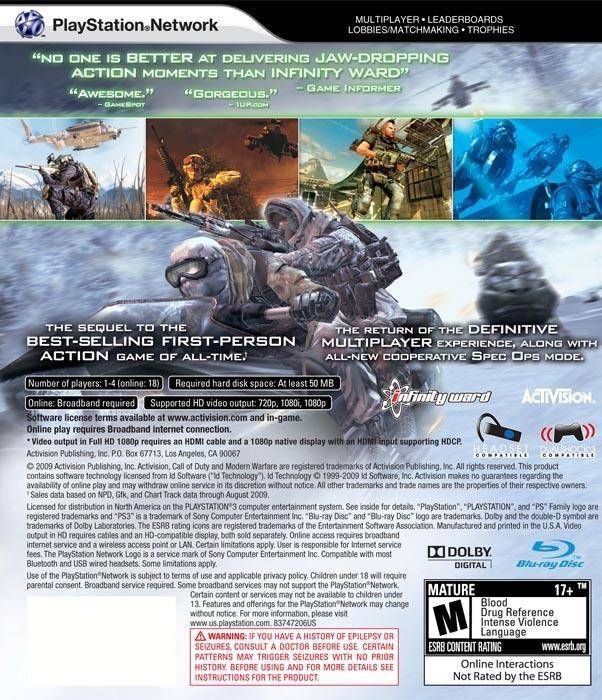 The best way to describe it is as a mash up between Tom Clancy and Michael Bay; plenty of tactical warfare, lots of explosions, and the obvious set pieces that range from a Siberian Base to an Oil Platform. Just like a classic Michael Bay narrative, action often takes the helm and other narrative aspects like transition and character development take a back seat. The good thing is that you will be having so much fun playing through the action that the failings in the other parts would transpire unnoticed. Infinity Ward kept the story fun and enjoyable, and this is all fans of the genre need. Also, there are several times that the blockbuster mentality is thrown to the wind, and actual jaw-dropping and deeply-emotional storytelling takes its place. These instances are nothing short of amazing and help create a complete experience with the action-packed segments of the narrative. The voice acting, music, and cinematic direction come together to improve the storytelling. The camera is used wisely in the first person perspective to allow the players to feel plot points with real impact. The stage designs are also well thought out to yield the most cinematic settings featured in any first person shooter. All the voice actors nail their respective characters and move the story along nicely. The music cues were also spot-on, as the developer knew which moments needed to get your heart racing and which moments called for the player to tranquilly reflect on recent events. 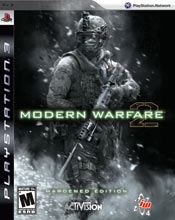 Modern Warfare 2 may not be the single best looking first person shooter of the generation, but it is beautiful none-the-less. The graphics are just gorgeous. The game runs at a steady 60 frames per second, and broken anti-aliasing is never seen. The depth of field and amount of on-screen geometry is insane and makes the game feel larger than life. The developer also threw in every conceivable particle, volume, and lighting effect; the smoke is some of the best volume effects I’ve ever seen. However, looking deeper shows some hiccups in the visual design; none of which are major. Some water effects look pretty dull, and in one stage the effect was just incorrect (water flows unnaturally off every concrete surface during this particular level). The enemies are very run of the mill and do not have a ton of variety, and when you shoot them you are treated to a cliché-over-the-top-annoying blood spray fountain. The most noticeable issues are frame rate drops during scripted event triggers and unimpressive close–up character models. 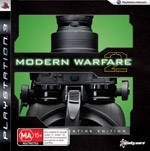 The gameplay is a conservatively polished version of the original Modern Warfare. Infinity Ward did not focus on making something new; instead they opted to make what worked so well perfect. The controls are responsive and feel natural. The down-scope aiming returns again and feels much better than other aiming styles. The best part is the visual and tactile feel of the weaponry. Everything feels so authentic and accurate. The sniper rifle fires with extreme power and aiming with it requires skillful precision. On the other hand, automatic assault rifles fire with some kick and trail off center when firing whole clips at a time. Some weapons feel less authentic, like the standard sidearm, but you will not use them often. 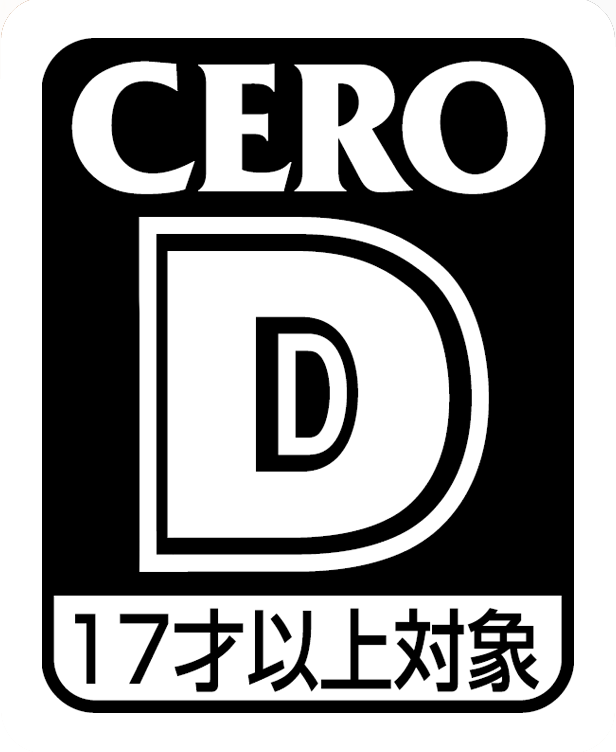 The game also retains its trademark tactical nature. Sure, you can run and gun through objectives, but this makes things so much more difficult for yourself. In Call of Duty, the best idea is to keep tabs on enemy positions, know your environment, and surgically strike. There are other segments added that break up the tactical gameplay and usually add some action flare. One such moment is fleeing from a Siberian Base on snowmobile; it’s so gleefully Michael Bay. There is also the ability to use a UAV to attack enemy waves from the air, which is really a joy. The AI also plays a huge part in the gameplay. They are smart and adaptive and will keep you on your toes. Waves of enemies will attempt to flank you or pin you in an area that offers little protection. In buildings, enemies will hide and take cover which forces you to find ways to isolate and take down. You also will notice marked behavioral differences between guerrilla militia and organized armed forces. The AI is designed to make you play in many different ways. Unfortunately, as much as Infinity Ward attempts to rise above established First Person Shooter conventions, they still fall victim to them in some areas, and this really hurts the game play. Running through alleys fighting guerrilla militia can quickly degrade from tactical fun to nothing more than Hogan’s Alley. Enemies pop out around corners, doors, or even open windows, and then duck down. You will throw strategy aside in these moments and simply use the down-scope aiming to pick them off before they hide again. Also, stages can seem pretty linear and nothing more than making your way to the next waypoint while engaging in several fire fights. This is really disappointing because having multiple ways to accomplish an objective would play nicely with the tactical spirit of the game. The 'horde' cliché also is prevalent in this game. Somehow there always seems to be an unrealistic amount of resistance. There is a careful balance between engineering a fire fight’s length for fun or to pad the time it takes to complete the game. 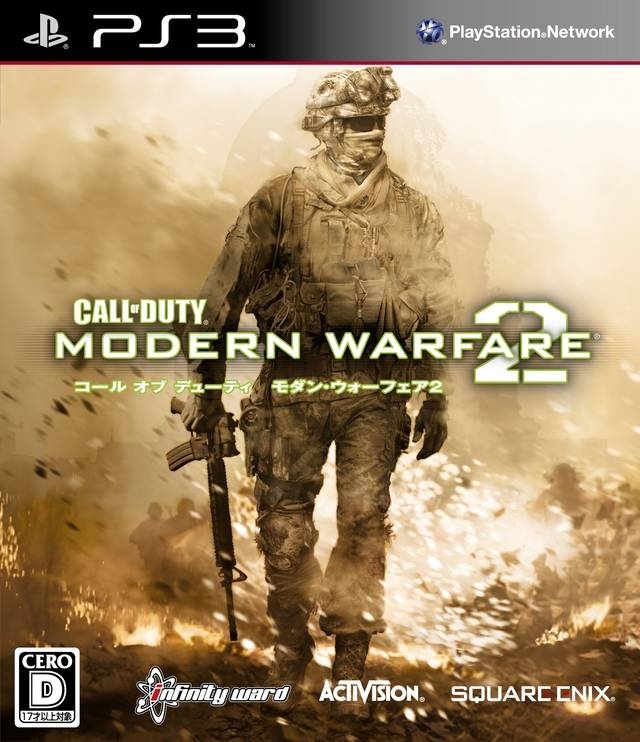 Modern Warfare 2 has many moments that feel like the latter, and there are times where you will be in one location far too long, taking cover and striking when able. And the biggest cliché of all is bullet time, which this game does use very occasionally, but it still feels terrible. It’s important to know that for every one bad gameplay experience there exist three or four great ones in this game. With the quality of the story mode, most developers would have called it a day. But not Infinity Ward. They crammed two extra modes into this disc that may severely out class the story mode depending on the kind of gamer you are. These modes are Multiplayer and Special Ops. Many shooters add a Horde mode as a tertiary addition, in which players work together to fend off waves of incoming enemies. 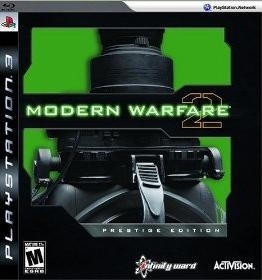 The makers of Modern Warfare 2 went above and beyond the call of duty (see what I did there?) with their tertiary feature; Special Ops. Special Ops are 23 different challenges set at set pieces featured in the game that you can take on by yourself, online, or with local split screen. The type of challenge varies, but can be broken down into different categories. Wave Defense is a classical Horde game as you will face off against wave after wave of enemies. In addition, there are Assault and Stealth challenges, snowmobile races, and even a chance to blow stuff up with an AC-130 gunship. And that’s only naming a few. 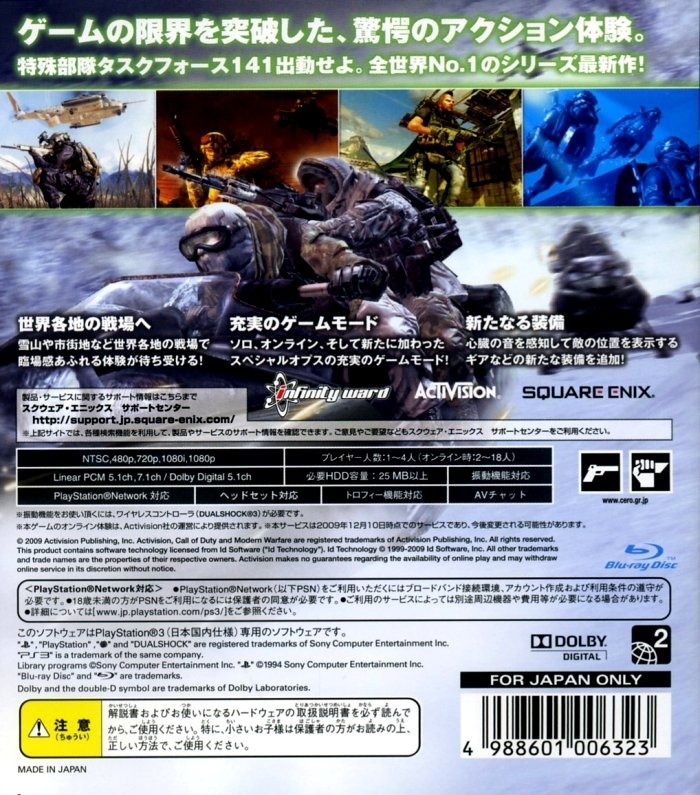 If this game was made my Kojima, Special Ops would be a completely separate and full priced game. 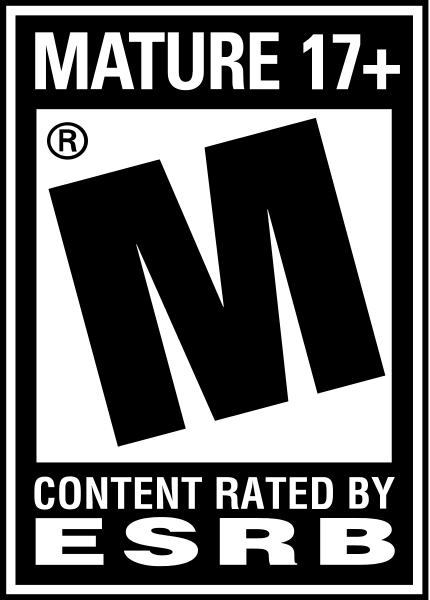 It’s hard to classify the Multiplayer as the secondary or primary mode. Fact is, most will spend the majority of their time in Multiplayer. 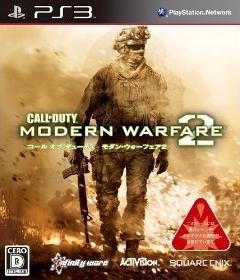 Like its predecessor, Modern Warfare 2’s multiplayer has every imaginable feature. Different classes, a ranking system, leveling system, customization, unlockables, you name it – it’s here. I count 14 different modes in multiplayer, including two that are played from the third person perspective. In addition to the achievements and trophies, this game offers medals, accolades, and emblems to earn. The leveling system has rich rewards and many modes can’t be played until you reach a certain level; this includes the mysterious Prestige Mode. Leaderboards and Stattracking are also included in the multiplayer experience. Infinity Ward is known for supporting the online community well and you can look forward to what they have in store for gamers in the coming months. The value of this game cannot be underestimated. There are three different modes that are crafted to perfection. The game challenges you to replay by offering tons of different items to collect and rewards to be earned. There are four different difficulty levels for the campaign, which takes about 5 hours to complete. Special Ops and Multiplayer offer online, system link, and splitscreen options. It is so nice to see splitscreen on a game like this. Many publishers truncate it in order to push more copies of the game, but Activision left it intact and passed a great value on to us. 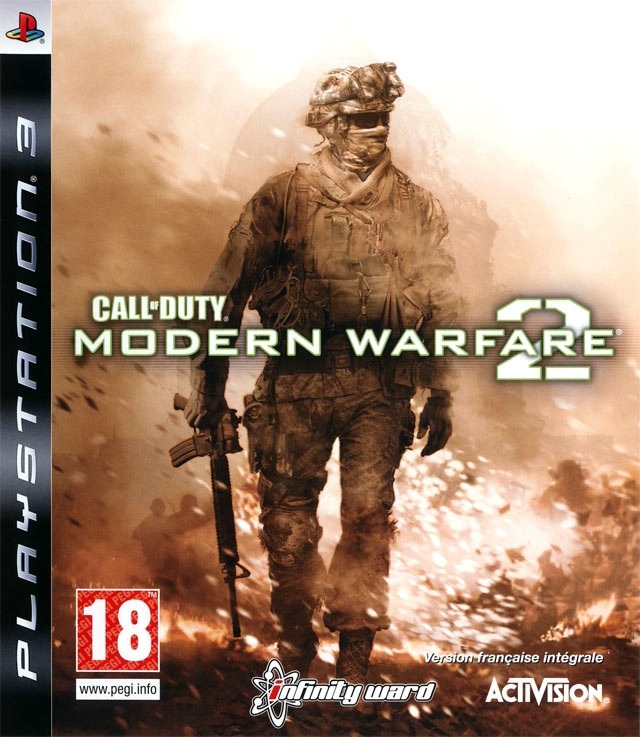 Call of Duty: Modern Warfare 2 is an example of how to do a sequel right. Everything fans wanted is included and polished. 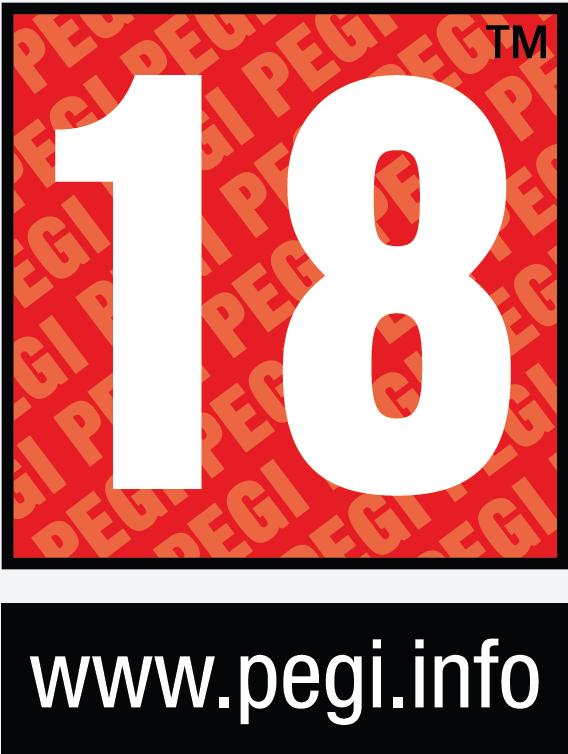 This is a game that can sustain the millions of purchasers for the next 2 years. Not many titles can boast that. Between the thrilling story and incredible value, this game may be the stand out gem of First Person Shooters this generation. Bottom line: it deserves the hype and accolades.